First up on our list is a classic, the Trametes versicolor mushroom, also know as the Turkey Tail Mushroom. This mushroom has been used for centuries for a wide variety of uses such as restoring vitality and fortifying the immune system. Recent research has identified peptide-like structures in Turkey Tail Mushroom, called polysaccharide peptide (PSP), which has been shown to optimize our immune system by making it respond to threats faster and with more intensity. 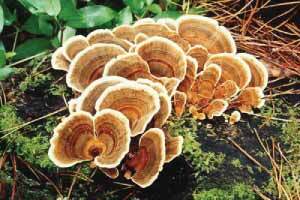 There is also a similar compound in Turkey Tail Mushroom called Polysaccharide-K (PSK). Both of these compounds are showing a lot of promise in research studies in recent years. Turkey Tail Mushroom appears to enhance the activity of the adaptive immune system in three major ways. The first is by activating toll like receptors (TLR) that are on T-Lymphocyte cells. T-lymphocytes are a subtype of white blood cells and play a major role in our immune system. Activation of the TLRs on the T-Lymphocytes causes two major things to happen. The first of which is proliferation of T-Lymphocytes, which results in the generation of more T-lymphocytes that will help defend our immune system. The second thing that will happen following TLR activation is that the T-lymphocytes will start to release two inflammatory compounds called cytokines. These compounds are interleukin-2 (IL-2) and interferon gamma (IFN-gamma). IL-2 helps hone in the activity of T-lymphocytes and other T-cells, whilst IFN-gamma helps directly fight off pathogens. Turkey Tail Mushroom is also able to activate the dectin-1 receptor. Activation of this receptor occurs through its interaction with beta-glucans found in Turkey Tail Mushroom. Dectin-1 activation leads to two major outcomes. The first of which is significantly increased phagocyte activity. Phagocytes are cells which can detect dangers to our immune system and respond to them by engulfing and destroying them. By enhancing phagocyte activity, we can fight off pathogens that are already in our body. Dectin-1 activation also causes the production of oxidative radicals and the release of TNF-alpha. This helps phagocytes attack threats in our bodies and can also by themselves help kill pathogens. Last but not least, Turkey Tail Mushroom can also activate B lymphocytes, which like T lymphocytes are a type of white blood cell. B lymphocytes, when activated by Turkey Tail, excrete antibodies. Antibodies look for and attach to pathogens. Once attached, the antibodies neutralize the pathogens. Taken together with all of the other effects Turkey Tail Mushroom has on the adaptive immune system, this makes Turkey Tail Mushroom a great pathogen attacker. With this in mind, Turkey Tail Mushroom would be a great supplement to reach for when you have already caught the sniffles as it will strengthen your adaptive immune system, allowing your body to fight off the sniffles faster. As a daily immune booster it is also great and Turkey Tail Mushroom even appears to enhance neurogenesis, but more on that another time. However, there are some other supplements on this list that will work better as daily immune boosters, such as EpiCor Yeast Fermentate. Nootropics Depot offers Turkey Tail Mushroom Extract powder and capsules for purchase. Unlike Turkey Tail Mushroom Extract, EpiCor is a great enhancer of our initial defense system, our innate immune system. It achieves this through a few different pathways. EpiCor works as a first line of defense against pathogens by strengthening the defenses of the eyes, nose, and ears. These are some of the most common entry points for pathogens and thus, it is very important that these have the best defenses possible against pathogens. An EpiCor Immune Health supplement boosts the release of secretory immunoglobulin A (sIgA). sIgA is an antibody which neutralizes pathogens before they can enter our bodies. This is arguably one of the best methods of naturally boosting the immune system, because if this system works efficiently enough, then most pathogens will never make it into our bodies, and in turn, will make it much harder for us to get sick. Now, let’s say the pathogens still get into our bodies, then EpiCor has another trick up its sleeve! Beyond our first line of defense, the second most direct line of defense is our gut. The harsh environment of our stomach makes it hard for pathogens to thrive and the numerous strains of good bacteria in our gut make it even harder for pathogens to thrive. By acting as a prebiotic, EpiCor has been shown to significantly increase the amount of two very important good bacteria; bifidobacteria and lactobacilli. Increased levels of bifidobacteria will strengthen the mucosal membranes of the stomach, while also inhibiting the growth of bad bacteria and pathogens. Furthermore, bifidobacteria can produce various vitamins such as thiamine, riboflavin, vitamin B 6, and vitamin K, which will all help support immune function. Lactobacilli appear to have effects slightly further down the digestive tract in the intestines. Lactobacilli help support mucosal integrity of the intestines by enhancing immunoglobulin A levels. Immunoglobulin A is an antibody, which has the ability to find and neutralize pathogens that can make us sick. Taken together, the increase of bifidobacteria and lactobacilli in the gut that occurs after EpiCor supplementation is a great way to fortify our innate immune system! Last but certainly not least, Epicor can help increase natural killer (NK) cell activity similar to Turkey Tail Mushroom. NK cells can detect cells that have been compromised by pathogens without relying on other cells. This is part of the reason why they are called natural killer cells, as it is in their nature to find and destroy infected cells. Since NK cells do not have to rely on other messenger or cells to make this decision, the action of NK cells is very fast. Due to this, it is considered to be a part of our innate immune system as it can ward of pathogens before they become a problem. In contrast to Turkey Tail Mushroom, the effects of EpiCor are more long term. This means that if you are already sick, then taking EpiCor may not be beneficial. However, long term supplementation of EpiCor, as seen with the Diamond V factory workers, will help fortify our immune systems long term. This makes EpiCor a great supplement to take to support overall immunity. Learn more about EpiCor Immune Health by visiting our EpiCor blog here. Nootropics Depot offers EpiCor Immune Health powder and capsules for purchase. Next on our list, is one of the more polarizing natural extracts of the last few years. Nigella Sativa, which is also known as Black Seed Oil, has been purported to be a "cure-all" for centuries now. While some people still believe this to be true, anecdotal and scientific evidence does not fully support it being a "cure-all." That said, Nigella Sativa does have some very interesting and potent effects. A lot of these effects are more on the nootropic side of things and we recently wrote an in-depth blog about nigella sativa and its nootropic benefits which can be found here. However, in this blog, we want to delve into the potent immune support effects of black seed oil. What is Thymoquinone in Black Seed Oil Extract? Nigella Sativa contains a plethora of different compounds, with one of the more active compounds being Thymoquinone. Due to this, we decided to carry a black seed oil extract in powder form that has a very high concentration of Thymoquinone (5%) in it. So, instead of focusing on black seed oil itself, lets take a look at Thymoquinone in isolation. Thymoquinone is a quinone compound, which puts it in a similar class as Coenzyme Q10, PQQ and Vitamin K (which are also all quinone compounds). In fact, it seems that various naturally occurring quinone compounds all have potent effects on overall health. One of the most prominent immune boosting effects of Thymoquinone is somewhat similar to the effects of Turkey Tail Mushroom. Thymoquinone appears to potently enhance the activity of phagocytes. In addition to increased phagocyte activity, Thymoquinone also significantly enhances the efficacy of phagocytes. It has been observed that phagocytes exposed to Thymoquinone have a much higher success rate at killing the pathogens they trap. However, as the cherry on top, Thymoquinone can also suppress nitric oxide release from macrophages. This is important as nitric oxide produced through iNOS (which Thymoquinone blocks) can have wide spread inflammatory effects throughout the body. Taking these effects into account, Nigella Sativa Extract and Turkey Tail Mushroom would more than likely have a highly synergistic effect on phagocyte activity. Thymoquinone can also enhance interleukin 3 (IL-3) secretions from T lymphocytes. IL-3 is an important cytokine that induces growth of new myeloid cells such as myeloid progenitor cells, granulocytes, monocytes and dendritic cells. These all help boost overall immune function by producing antimicrobial agents, aiding phagocytes and producing enzymes that dissolve bacteria and can selectively create pH environments that are toxic to pathogens. Overall, enhanced IL-3 secretions are likely a pathogens worst nightmare, and will help with both keeping the pathogens out of our system and fighting them once they are already in. Again, it seems that Nigella Sativa Extract will stack particularly well with Turkey Tail Mushroom as it enhances the growth of new T lymphocytes. In theory, this should lead to synergistic increases in IL-3 secretions, since enhanced IL-3 secretions from a Nigella Sativa supplement is dependent on T lymphocytes. In addition to this, Thymoquinone also appears to enhance the efficacy of natural killer cells (NK), an effect that it shares with both Turkey Tail Mushroom and EpiCor. Overall, Nigella Sativa is a very solid natural immune booster. Nigella Sative Extract will both help protect from pathogens whilst also fighting off pathogens that are already in our bodies. This would be a great natural immune supplement to take on a daily basis to protect ourselves from the winter sniffles. It would be especially interesting to take longer term due to its other health boosting and cognition boosting benefits as well. From everything on our list so far, Nigella Sativa Extract will be the most versatile and adaptive as a daily immune supplement. However, if you are looking for a more selective natural immune booster, then EpiCor is still the most ideal product for you, as besides immune system boosting effects, it doesn’t do a whole lot else. Learn more about Nigella Sativa Extract (Black Seed Oil) by visiting our Nigella Sativa Extract blog here. 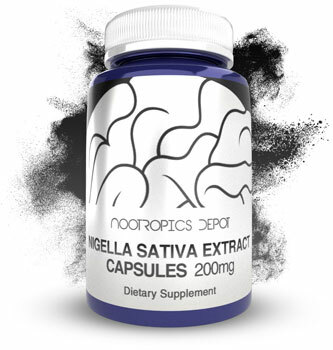 Nootropics Depot offers Nigella Sativa Extract powder and capsules for purchase. Now we are starting to veer into some uncommon territory. As you know, Nootropics Depit likes to stay on the cutting edge of natural supplements. However, the previous three immune supplements are ones you may have already heard of; especially for immune boosting purposes. Palmitoylethanolamide is likely one you haven’t heard of in general; and if you have, then immune boosting is likely not the first thing you would think of. Interestingly enough though, some of the first-use cases for Palmitoylethanolamide were to support the immune system. In particular, Palmitoylethanolamide was brought to market in the late 1960’s for speeding up the recovery from the common cold. Large-scale studies were being run at the time on factory workers at the Skoda car factory and among soldiers as well. Initial studies were promising, and follow up studies on soldiers showed positive results too. In addition to studies indicating that Palmitoylethanolamide could be helpful at warding off an active common cold, it also appears to work well as a preventative. Taking this into account, Palmitoylethanolamide may combine both the long-term immune boosting effects of EpiCor with the beneficial effects of Turkey Tail Mushroom on active colds. So how does Palmitoylethanolamide achieve this? This is where things start to get fairly interesting as Palmitoylethanolamide appears to signal through our cannabinoid system. Specifically, it appears to interact with the CB2 cannabinoid receptor which is highly expressed throughout our immune system. CB2 receptors regulate cytokine release, which are compounds that T lymphocytes, marcrophage, B cells and, monocytes utilize to fight off pathogens. The CB2 receptors appear to be directly expressed on all of these cells, and activation of CB2 receptors modulates cytokine function. Palmitoylethanolamide appears to significantly up-regulate CB2 receptors, and via this mechanism can boost immune function through a wide variety of immune regulators. Furthermore, via a reduction of cyclic adenosine monophosphate (cAMP) palmitoylethanolamide may be able to upregulate immunoglobulin M (IgM) levels and interleukin 2 (IL-2) levels while also boosting T lymphocyte activity. IgM is the largest antibody present in our bodies and helps us to neutralize pathogens. IL-2 regulates overall white blood cell activity, and by boosting IL-2 levels we can optimize our white blood cells to fight off pathogens. Similar to CB2 receptors, peroxisome proliferator-activated receptor alpha (PPAR-alpha) are also widely expressed throughout the immune system. Just like with CB2 receptors, Palmitoylethanolamide also appears to modulate PPAR-alpha. In fact, a standing theory is that upregulation of CB2 receptors by Palmitoylethanolamide is caused by PPAR-alpha activation. However, PPAR-alpha also has its own unique immune regulating effects. Similar to CB2 receptors, PPAR-alpha regulates cytokine release but it does this in a very balanced way, allowing our immune systems to hone in on what is important while limiting some of the inflammatory effects various cytokines can produce. Overall Palmitoylethanolamide, like EpiCor, can be a great long-term immune booster while also being able to fend off common colds. In addition to this potent immune boosting effects, Palmitoylethanolamide also has a whole plethora of other interesting effects including pain relief support. You can read more about Palmitoylethanolamide here. Learn More about Palmitoylethanolamide by visiting our Palmitoylethanolamide blog here. Nootropics Depot offers Palmitoylethanolamide powder and capsules for purchase. For the last immune booster on our list we are finishing off with yet another uncommon one, in two different ways. The first thing that makes Salidrosol unique is that it is a synthesized take on rhodiola rosea. Rhodiola rosea contains three main bioactives, salidroside, rosavins and tyrosol. Through lots of research and beta-testing we found that we liked the effects of high salidroside extracts the most, yet it was very difficult to find high salidroside rhodiola rosea extracts. Thus, we thought why not source just pure salidroside? This simple idea turned out to be quite the hassle, as salidroside is hard to produce and incredibly expensive. However, after lots of effort and research we were able to source 99% pure salidroside. We decided to use 10 mg of salidroside and combined it with another 10 mg of tyrosol. This combination is like a very highly standardized and consistent rhodiola rosea extract. As the cherry on top, we even found that salidroside and tyrosol work well sublingually. To utilize this, we decided to put the salidroside and tyrosol into a sublingual solution. We recently discovered that both tyrosol and salidroside are potent immune boosters. Salidroside, which is the glycoside of tyrosol, appears to enhance levels of interferon gamma (IFN-gamma) and tumor necrosis factor alpha (TNF-alpha). Both IFN-gamma and TNF-alpha are potent antiviral cytokines that can help fight off pathogens. TNF-alpha is a potent immune booster and is involved in many aspects of our immune response. Its main effects, are geared towards destroying pathogens and by doing this, can help fight of pathogens that have made it into our bodies. IFN-gamma is a key player in both our innate and adaptive immune system. IFN-gamma is boosts levels of Class II major histocompatibility complex (MHC). MHC is an important molecule that helps guide antibodies, T-cells and white blood cells to threats. Without MHC these immune defenders would not know where to go and thus boosting MHC levels will allow our immune system to attack the right targets. Tyrosol on the other hand works through a fairly different mechanism than anything we have discussed in this blog. Rather than aiding our immune system, tyrosol directly takes care of pathogens. It does this in part by inhibiting hemolysis. Hemolysis is a virulence factor which is used by pathogens to spread and damage our bodies. By inhibiting hemolysis, tyrosol can prevent the spread of pathogens and the damage they can induce. Furthermore, tyrosol appears to be able to shut down ATP synthase of bacteria. ATP is one of the main energy molecules that are used by bacteria and thus, shutting it down will kill the bacteria and slow down their spread. Taken together, Saldidrosol will boost your immune system whilst also defending us from threats to our immune system in a direct way. This should make it a great supplement to take daily to improve our defense, yet it would also be beneficial to take once you have already caught a cold. In addition to all of the other cool effects of Salidrosol, such as mood enhancement, stress reduction, and endurance enhancement, this would be a good all rounder to take this winter. Nootropics Depot offers a 30mL dropper bottle of Salidrosol Solution by Natrium Health. Natrium Health is the sister brand of Nootropics Depot. Learn more about Natrium Health here.